One of the biggest tours of the year hit the CenturyLink Center on Saturday, April 27th. Jason Aldean, along with Jake Owen and Thomas Rhett performed to a sold out crowd in Omaha. With many in anticipation of the night, a lot of people put out their favorite country outfit to enjoy the show. The whole night the crowd was energetic and Thomas Rhett did a great job of kick starting the night to warm up the crowd. Thomas Rhett is a 23 year old musician who has been part of the music industry for a while now. Having worked with Jason Aldean and helped write songs for him, including Jason’s current single, “1994,” Thomas started out as a songwriter and then started performing himself. Backstage Entertainment sat down with Thomas Rhett before the show to talk about his career and how the tour has been going. Thomas talked about how he tries to get in a round of golf everyday and in Omaha it was no different. He went to Happy Hallow in the morning and also had some batting practice with the Storm Chasers as part of his free time. As far as getting the news about the current tour he’s on with Jason Aldean and Jake Owen, he was on a golf course at the time playing a great round and got a call in the middle. They let him know that Jason wanted Thomas to open the shows on his tour. The round went downhill from there due to all the excitement and what was now on his mind. The night turned out to be great, with weather that finally seemed more like spring in Omaha. Everyone had a great performance with Thomas Rhett opening the show playing for about 25 minutes, Jake Owen playing after him with a 60 minute set, and finally, Jason Aldean playing for 75 minutes. The tour will continue through the better part of the year so make sure you check out the tour dates for one coming to a city near you. 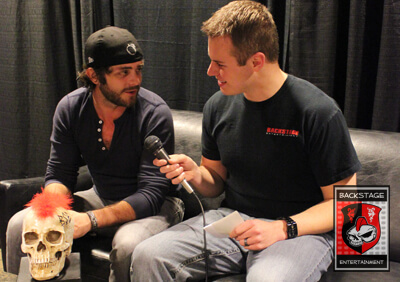 Make sure to check out the links below for our interview with Thomas Rhett. Also check out the link for photos from the interview and live shots of Jason Aldean’s performance on Backstage Entertainment’s page.